Our institutions and policies shape who has access to wealth, health and prosperity. The Tenants Union will host community meetings to educate low-income renters about ways to address barriers to housing and work together to increase their leadership skills, including through the power of narratives. Puget Sound Sage and Transportation Choices Coalition aim to ensure communities of color, immigrants and refugees share in and prosper from the benefits of transit, specifically Sound Transit 3. This includes representation of marginalized communities in decisions such as station location and accessibility, equitable development and affordable housing along transit lines. FEEST is dedicated to developing youth leadership for health and food justice. Youth leaders will extend their impact in South King County schools by working on policies to increase access and affordability of healthy and culturally-relevant foods. Nine racial/ethnic health boards will come together to establish the Community Health Board Coalition (CHBC) to strengthen social cohesion across groups by creating a joint policy agenda and ultimately positioning the CHBC as a powerful voice for health. The Washington Bus Education Fund aims to engage young people in generating creative policy solutions and increasing voting rates. Keys issues for young people include access to post-secondary education and voting access. Open Doors for Multicultural Families will increase opportunities for individuals with developmental disabilities and their families--many from diverse cultural or linguistic backgrounds--to engage in policy and advocacy. Identified focus areas include education, access to recreational opportunities, stable and affordable housing and reliable para-transit. Got Green will work to address disparities that often keep well-qualified people of color out of "green economy" internships and careers. This includes investing in fellowship programs to develop young leaders in the environmental justice movement and to advocate for measures to diversify the workforce in the environmental sector. This effort aims to transform the criminal legal system and promote policies that support the people and communities of color most impacted by violence, including increased rehabilitation rather than incarceration. It seeks to amplify the voices of crime survivors whose experiences have reinforced that punitive measures often worsen the conditions that lead to crime in the first place. This project will create a gender affirming health care policy agenda after engaging stakeholders in discussions and surveys on challenges that transgender community members have in accessing gender affirming care and that medical providers have in connecting them to it. This group will work to develop the skills of low income Latino residents in South King County to become emerging leaders who are advocating for the needs of the community. They will conduct a survey of existing leaders and convening on community priorities to help develop a change campaign in 2019. This project will strengthen cross-sector collaborations between neighborhood organizations and the school district to promote healthy youth development in Southeast and Central Seattle and more effectively address mental health and violence issues in the community that hamper the futures of students. This organization will engage small family businesses to mitigate changes in the neighborhood and to strengthen Little Saigon in Seattle's International District as a cultural hub for the larger Vietnamese population. This collaborative of five organizations and connected partners will advance multiple anti-displacement strategies. This includes development of policy issue briefs and pilot projects to increased affordable housing, support small businesses and increase authentic community engagement and leadership. This coalition harnesses the voice of parents and young people to build community power and advance policy goals and strategies that end the use of discipline practices that disproportionately affect students of color in public schools. The WICRC will build relationships with public officials and develop leadership within the Native community through a series of advocacy and listening events with the Washington State Department of Children, Youth and Families. In King County – one of the most prosperous metropolitan regions in the United States – race, income, and ZIP code are major predictors of a person’s health and life expectancy. Low-income communities and communities of color regularly experience institutional racism that leads to disparities in health and well-being. To reverse these inequities, these new partnerships are designed to support leadership and civic engagement among groups that have historically been marginalized, sharing in decision-making and power, and working together to improve outcomes for all communities in our region. Kent Community Development Collaborative is a partnership of community-based organizations working to ensure everyone can participate and benefit from decisions that shape their neighborhood and greater community. The partnership will convene community forums focused on creating affordable, safe housing for Kent residents, as well as opportunities for living-wage jobs and access to healthy, affordable foods. In White Center, a key priority driven by residents and grassroots organizations is anchoring multi-cultural businesses and partnerships in the community to prevent displacement. Paramount to this work is increasing community leadership, with an emphasis on engaging young people. Snoqualmie Valley Supportive Community for All will strengthen community connections by building an inclusive coalition of service providers and key community stakeholders around a shared vision of coordinating human services across the Snoqualmie Valley. Partners in SeaTac/Tukwila have taken a bold approach to expanding economic opportunities and promoting health. Through the Food Innovation Network (FIN), community members in SeaTac and Tukwila receive training and support to become “Community Food Advocates,” who lead activities such as community kitchen dinners and healthy activities for kids. The Transgender Economic Empowerment Coalition will address the economic barriers transgender and gender-nonconforming communities and LGBTQ people of color experience as a result of transphobia, homophobia and racism. The Coalition will build leadership development programs and engage area employers to develop model employment policies. 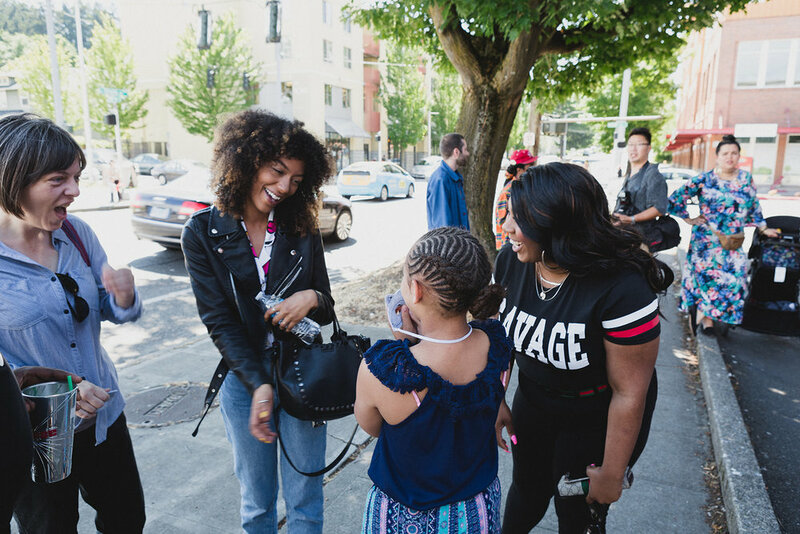 Africatown: Replanting Roots, Rebuilding Community is bringing organizations together in the heart of Seattle’s historic African American community to strengthen the community’s sense of place in the face of displacement due to historic practices and current gentrification. The project will focus on shaping existing and planned affordable rental housing and commercial development efforts to preserve and restore community connections and economic opportunities for African American/African diaspora community in the King County region. SUNN is a roundtable that aims to unite the efforts of Native-led organizations to advocate for policies and positive changes that will improve health and well-being. The partners include the Potlatch Fund, Seattle Indian Health Board, Na’ah Illahee Fund, Chief Seattle Club, and NAWDIM, who all have a long history of engaging in the needs of urban Native families and relatives through a unique cultural lens.